Do you have ancestry in the Moreton Bay area? Almanacs are a valuable resource for social historians as well as for researchers in other fields of Australian history - plus a great genealogy tool for anyone searching their family history and building a family tree. 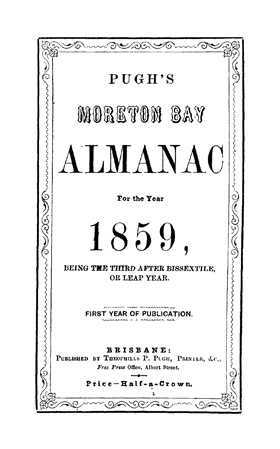 This Pugh’s Moreton Bay Almanac contains a comprehensive almanac of the Moreton Bay area giving information on weather, events, history of the colony, the government, institutions, churches, schools and more. It's also a useful tool for finding out information about the society in which people lived, and the people they knew.